As part of a project to Remember all of Barnsley’s WW1 servicemen and women last year the Barnsley War Memorials Project transcribed the 1918 Absent Voters’ List which gives the names and military details of over 6,000 men from Barnsley who served in the war, most of whom came home safely. Two thirds of service records from WW1 were destroyed in the blitz in WW2 so this listing is often the only clue we have to these men’s time in the armed forces. A copy of the transcription can be found in Barnsley Archives where you can also view the original document on request. 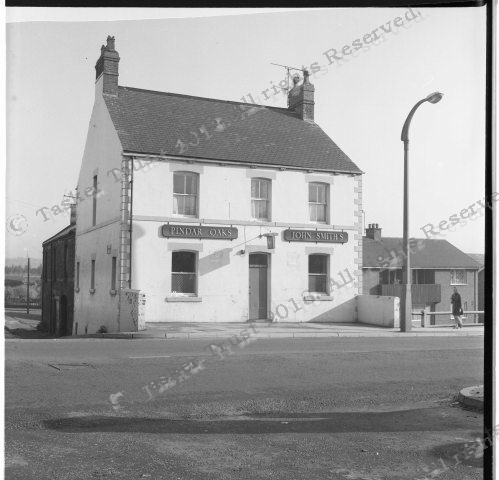 Pubs are not named in the Voters’ List but if on checking the address in the 1911 census the occupation of the residents suggests the pub trade the Tasker Trust website is the next place to call to find a photo of a lost pub. The Moorhouse brothers, Ben and Henry appear in the Absent Voters’ list at 274 Doncaster Road. Ben is listed as a Second Lieutenant in the Royal Engineers and Henry as a Lance Corporal in the 4th Reserve Battalion of the King’s Own Yorkshire Light Infantry. Trying to find Ben on the Lives of the First World War website the only match available was a Captain Ben Moorhouse – but checking his Medal Index Card confirmed his home address as above, so he had been promoted quite rapidly. Only men who served abroad have medal cards and nothing could be found for Henry, suggesting he served his time entirely in the UK. In the 1911 census no. 274 Doncaster Road is named as the Pindar Oaks Hotel, and is the home of the Moorhouse family headed by George Henry Moorhouse, occupation beerhouse keeper, aged 38, married to Sarah, with five surviving children (a baby, Walter, died in 1897 aged just 3 months) living at home along with a niece, a servant girl and a visitor. His son Ben is 16 years old and ‘assisting in the business’, whilst Henry is 14 years old and is an apprentice joiner. On the Tasker Trust website a search for the pub brings back this picture and a list of occupants covering one hundred years. The first licensee listed was John Harper in 1872, then Henry Moorhouse took over in 1883. A quick search of local newspapers on the Find My Past website returns a few mentions of Henry at the pub. In September 1883 the York Herald reports that H Moorhouse of the Pinder Oaks Hotel, Measbro’ Dyke, offered £15 in prizes for a Pigeon Flying Leger which was advertised as the largest competition to take place in South Yorkshire for some time. The birds flew from Doncaster Railway Station to their own cotes at Ardsley and Barnsley. Henry advertises a Grocer’s Shop and House to let at Barugh Green in the Barnsley Chronicle in 1885, which could have been the family’s previous home. Henry died in June 1898 aged 66 and is buried in Barnsley Cemetery. The pub passed to his widow Betty and then on her retirement in 1908 to their son George Henry Moorhouse, who had previously been a Pork Butcher at 260 Doncaster Road. Betty dies in 1922 aged 84 and is buried with her husband. In 1929 George Henry and his wife Sarah retire to a nice new semi-detached house in Doncaster and their son Henry Moorhouse jnr, who had been the KOYLI soldier in WW1, takes over the pub very briefly until his death in October 1929 aged just 33. The next name listed on the Tasker site is Elsie Moorhouse, who is Henry jnr’s widow. The pub passes out of the family in 1932 with five more licensees until its closure in 1972. A picture from a similar viewpoint on Google Maps today shows new housing on Portland Street has replaced the pub. The 49 year tenure of the Moorhouse family at the Pindar Oaks Hotel was not their only connection to the pub trade. Tracing the family backwards through the census returns before their arrival on Doncaster Road I found that they were at the Spencers Arms at Barugh in 1881. Henry Moorhouse snr, born 1833 in Hepworth, nr Holmfirth, is listed as a Beer Seller. Henry and his family were in Barugh at an unnamed establishment in 1871, where he was listed as a Miner and Publican. A newspaper cutting from 1869 mentions Henry Moorhouse applying for a spirit licence for a beerhouse in Ardsley, which was refused, but with a watching brief for the next year. In 1861 they were living at Low Hill, Higham and Henry’s occupation was solely as a Miner. The family appear to have progressed from a modest background and worked their way up by taking on various pub businesses and expanding over the years. I did wonder why Ben Moorhouse, being the elder son, had not taken over the Pindar Oaks Hotel in 1929 when his father retired. It seems that obtaining a commission in the Royal Engineers during the war changed his life. He had enlisted early in the war, first arriving in France in October 1915. He was commissioned in September 1917 and would have had some special training as a ‘temporary gentleman’ as part of this. After the war he took a B.Eng Degree whilst still living at the Pindar Oaks Hotel. He married Phyllis Crossland, daughter of the Registrar at Barnsley Cemetery in 1924 giving his occupation as Engineer; his brother Henry had married her sister Elsie in 1920. He had finished his Electrical Engineering degree by 1927 because by then he and Phyllis had moved to a new semi-detached house in Osbaldwick near York. In 1939 he is a Works Manager for a firm of Chocolate and Confectionary Manufacturers in York (maybe Terry’s?). The Moorhouse family’s journey from coal miners to professionals had continued, helped along the way by Ben’s experiences in the First World War. No wonder he hadn’t wanted to take on the family pub!